Bhagat Singh was one of the most influential Indian freedom fighter revolutionary who wanted to overthrow British rule from undivided India. At that time, the British treated better with thieves and murderers than Indian freedom fighter prisoners. 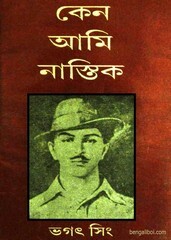 Bhagat Singh wrote the diary while in jail. He read a lot of books. The words that he would like, those are kept writing in his diary. When Bhagat Singh's day was being spent in jail waiting for hanging, at that time he wrote the article 'Why I am an Atheist'. To day I want to share this book in Bengali language - Keno Ami Nastik. The book has 32 valuable pages, 7mb pdf file size.